Did I choose rural? Or did rural choose me? Bear with me as I take you back a few years and give you a glimpse of my story. Running wildly with a pack of children, pot luck impromptu weekend gatherings, garage sales with my grandma – these are a few of my favorite memories. Growing up, my friends were all related to me – didn’t everyone hang out with their cousins? Family trips revolved around visiting the family members. You know, the one family member who ventured west to the Dakotas. College took me to the big city – Moorhead. Like all other 22 year olds, I had my eye on warmer climates after graduation, dreaming of moving to Arizona. Yep, no snow sounded good! Plans change. Met a nice young man, shiny ring, loved me, loved my family. Landed a job with an organization called “West Central Minnesota Initiative Fund.” Would I be interested in joining this new nonprofit? We have funding for two years. What a ride! Spent the next 30 years raising our kids, who in turn played daily with their cousins. Grandparents were half a mile away. Family. Twenty-nine years later and never looked back. And if you do the math, I’m only 26 years old. Once you get to experience the rural way of life, and all of the amenities and opportunities it affords, rural has chosen you. Family. Friends. Opportunities. I can’t wait to be a part of the next generation's “rural choice.” And sharing garage sale treasures with my grandson is priceless. 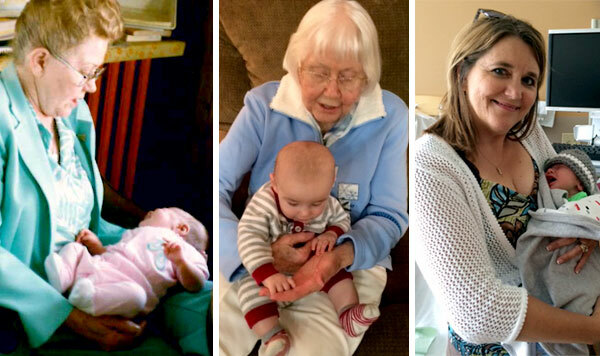 Photos, left to right: Sandy King's grandmother holding Sandy's daughter, Kelsey--and holding Kelsey's son, Mason, 25 years later; Sandy holding grandson Porter.